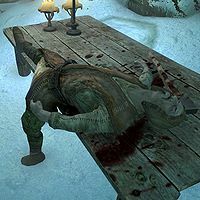 Imperials are unnamed and deceased Imperials scattered around Skyrim. These Imperials are all male citizens and wear randomly determined farm clothes (7 variations) or a belted tunic, a pair of boots (4 variations), with a 50% chance for a hat (3 variations). Additionally there is a slim chance they may carry a lockpick and a small amount of gold. 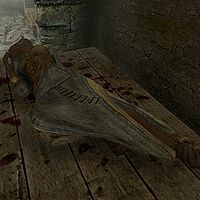 One in Bloodskal Barrow, in an alcove near the entrance to Solstheim. One at the base of the tower of Nilheim. One inside a barrel storage room in the escape tunnel of Treva's Watch. One on an iron ore vein in a cell in Knifepoint Mine. One in Haemar's Cavern, in the large room. One next to a dead Orc bandit in the southeastern chamber of Lost Echo Cave. These Imperials are all female citizens and wear randomly determined farm clothes (7 variations) or a belted tunic, a pair of boots (4 variations), with a 50% chance for a hat (3 variations). Additionally there is a slim chance they may carry a lockpick and a small amount of gold. One inside a cell in the West Tower of Mistwatch, right after entering. One on a table near the book The Importance of Where in Gallows Rock. One on the altar in front of Clavicus Vile in Haemar's Shame. One used in a world interaction. One on a stone table in the forest west of Roadside Ruins, with a copy of the skill book 2920, Frostfall, v10 nearby. This page was last modified on 28 January 2016, at 00:40.